Othmar Schoeck (1886–1957), composed two separate works that include dramatic vocalization: the opera Venus, op. 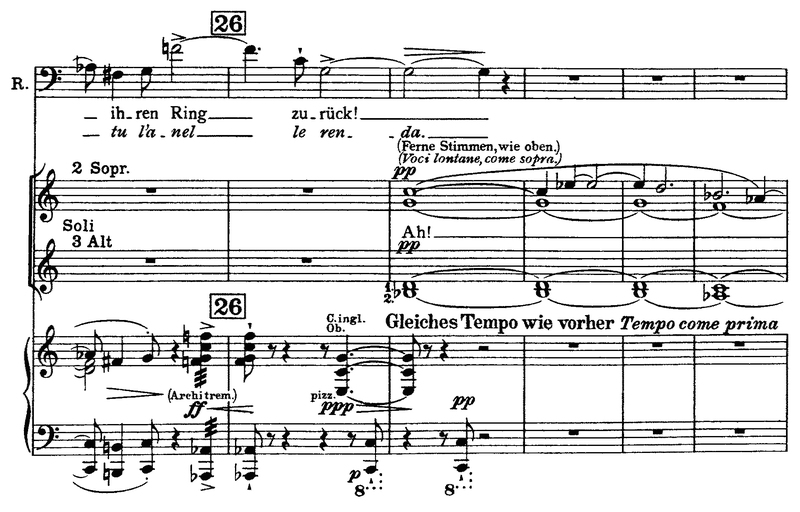 32, and the orchestral song-cycle Lebendig begraben, op. 40. Born in Brunnen, Schoeck attended the Zürich Conservatory from 1904–7, then, after a personal invitation from Max Reger, joined the latter’s composition class in Leipzig. Schoeck’s musical personality, however, was already so developed that Reger had no particular influence on his style. In 1908, Schoeck returned to Zürich, where he spent the rest of his life. Venus (1919–21; revised version 1933) is in three acts to a libretto by Armin Rüeger, a childhood friend and also author of the librettos for Schoeck’s Don Ranudo (1917–18) and Massimilla Doni (1934–36). The story of Venus is based on Prosper Mérimée’s novella La Vénus d’Ille, and Eichendorff’s short story Das Marmorbild. The composer conducted the premiere in Zürich on 10 May 1922. The setting is a country castle in Southern France around 1820. Act 1 takes place in a meadow in a park surrounded by soaring trees. Horace, a bridegroom on the eve of his wedding to Simone, talks with Raimond, his friend. The latter expresses doubts regarding Horace’s readiness for marriage after years of dissolute living. Baron de Zarandelle, an amateur archaeologist and Horace’s uncle, arrives with the wedding guests and unveils his gift, a bronze statue of Venus. The ensemble voices its fear of the ominous beauty of the heathen goddess. Horace alone feels strangely drawn to the statue. Act 2 takes place in the main hall of a castle, with a view of the statue in the background. The masked wedding ball commences as the guests arrive. Horace follows an unknown woman with growing excitement and forgets his bride. He approaches the unknown woman and, as she points to the wedding ring on his finger, he removes it and puts it on her finger. Intoxicated with desire, he removes her mask to find Venus. The pedestal in the park is empty. The unknown woman (Venus) slowly bends to him and they exchange a long kiss. Simone appears and faints at the sight. Venus flees, with Horace in pursuit. A storm arises, mirroring Horace’s inner turmoil. Act 3, set in the park, like the first act, begins with Horace wandering by night in search of the vanished unknown woman. Raimond waylays Horace and attempts to recall him to duty and honor. Raimond asks Horace to either return to his bride or give back the wedding ring. Horace can do neither. Raimond then challenges Horace to a duel, during which Horace strikes his dagger from his hand. Raimond flees. Horace sings his great final aria and then throws himself into the statue Venus’s arms—the wedding ring on the statue’s bent finger—and dies. This occurs immediately before Horace tells Raimond that he can no longer return to his bride (“Ich kann nicht mehr!”) [“I cannot do it any more!”], having been seduced by the noumenal voices, Venus herself. Raimond demands that Horace return the ring to Simone. Before he can respond, the offstage voices sing the Venus-theme again, followed by Horace’s reply, “Das kann ich nicht!” [“I cannot do that!”]. In both examples the melodic content of Horace’s response is the same. Two additional brief appearances of the Venus-theme occur following those with wordless chorus: one during Horace’s Liebestod, played by solo violin; the other following his farewell, played by five solo violins, mirroring the earlier offstage voices. 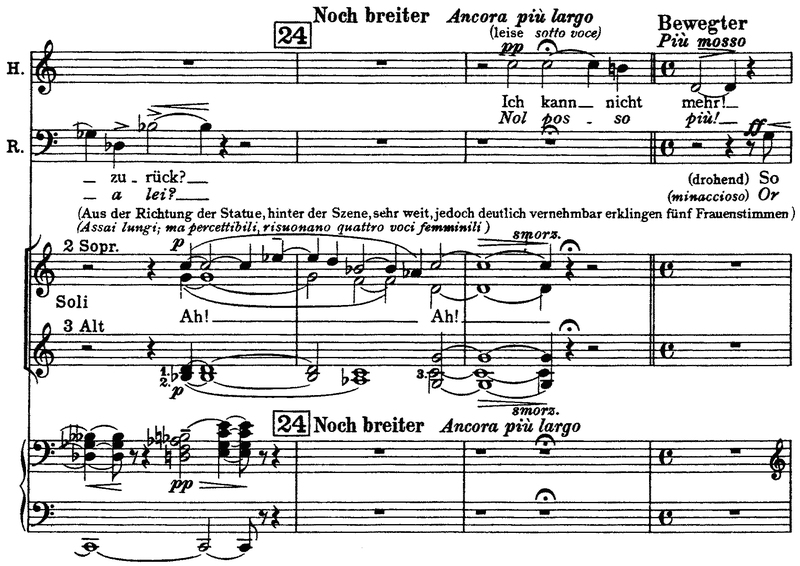 The final notes of the opera are the same as those used for Horace’s response (“Das kann ich nicht!”). 1 Othmar Schoeck, Venus (Wiesbaden: Breitkopf & Härtel, 1953), 202.